The auto repair industry is currently thriving in the United States. The industry has grown by 2.6% over the past five years, reaching a revenue of $67 billion in 2018. This is primarily due to the average length of car ownership for new and used vehicles, which has increased 60% in the last 10 years - leading to more auto repairs. In addition, 75% of repairs and maintenance completed on vehicles is done at independent automotive shops, in comparison to 25% that is done at dealerships. In order to gain a share of this growing market, auto repair shops must build an effective marketing strategy to attract new clients, retain existing clients and stand apart from competitors. And by integrating both radio AND digital into your marketing strategy, you can deliver more powerful results for your auto repair shop. Today’s auto owners and shoppers are digital savvy and mobile-first. However, despite the popularity of digital tools and channels, radio reaches nearly every adult (93%) on a weekly basis. Potential clients may hear your radio ad while driving their car, for example, when they are most aware of any type of repair issue. You can then use social media and digital advertisements to retarget these same listeners as they are using their mobile device or browsing online. You’re reaching your customer base where they are, and that’s more important today than ever before. Mechanics need branding, too. As an auto repair shop, it’s easy to get lost in the sea of local competitors. But branding through radio and digital channels can help you stand out and help clients remember you. The key to increased awareness is consistency and frequency. At Zimmer, we commit to a 21 52 advertising plan to ensure listeners hear your ad at least three times to influence their decisions. Incorporating digital advertising will only increase your frequency and drive brand awareness. 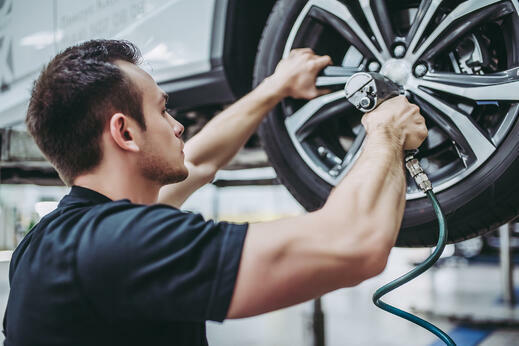 With an auto repair shop, you need to take every opportunity to be creative with your marketing and advertising campaigns. When you combine digital and radio, it’s much easier. The phrase “theatre of the mind” describes the power of audio, as it can evoke mental images, associations and emotions - particularly through radio. Pairing radio ads with visual content in digital channels can increase recall and further influence your audience’s purchase decisions. For example, your radio ad can include notable sounds like a car cranking, hood closing or metal clanks. Then, you can retarget listeners with a digital ad that includes an image or video depicting those sounds to keep creative consistent and further reinforce your message. There’s a good chance that most of your customers will be local; therefore, many of them will be searching for auto repair services using local search terms. Radio can play a major role in boosting your local search. According to a study commissioned by the Radio Advertising Bureau (RAB), radio generated an average 29% lift in Google search activity - increasing the effectiveness of local SEO efforts. The key is to include local keywords in your radio ads that listeners will remember and search for online when they’re no longer driving. Then, you can use digital ads to further target these listeners online using the same local keywords. The reality is that an integrated approach that combines radio and digital will help you maximize your marketing efforts and drive more customers into your auto repair shop. Consider these benefits when evaluating your marketing strategy, and contact a reputable marketing partner to learn the best strategies for making the most of both channels.